How dangerous is air pollution? The EPA told a congressional committee that it can kill you right now! That air pollution is causal of acute deaths and by improving air quality we have saved 160,000 premature deaths each year. It's often the case that we don’t have time to carefully evaluate everything in life. We often take shortcuts. If a reputable authority takes a position, it is convenient and usually safe to just accept their reasoning. It's not so simple in the case of air pollution, more regulations, and saving lives. The United States Environmental Protection Agency was not only failing to act on evidence, they may have been engaging in "doublethink." I'll get to that shortly. First, the issue. In this case, particulate matter, those particles suspended in air that we know of as soot, pollen, dust, etc. On July 29th, 2016, the EPA issued its final PM Implementation Rule, which had an iron fist in a velvet glove for states; they assured citizens these were easy, common-sense methods while making it clear that the authority of both the courts and the federal government were going to make sure they were followed. They had emotion - everyone wants clear air, and they have authority - federal agents with assault weapons and huge fines. What they lacked was the science. That's where "doublethink" comes in. "Doublethink", popularized by George Orwell in "1984", is holding two different beliefs that are contradictory, perhaps in different situations. Affirmative Action was often accused of being doublethink, for example, because people were told to engage in racial bias to undo racial bias. Other examples, such as "act your age" but then "you're only as old as you think you are" are more amusing. In many people, there can be emotional and rational doublethink. Even in EPA officials. Through much of human history, authority and emotion - which the EPA has invoked - were the primary modes of decision making. Logic/data/analysis are late comers to the process. Yet it should be the primary driver for EPA decision-making. That it isn't seems to be due to doublethink. With their air pollution decision, we have to look for the source of doublethink in the First, let's look at particulate matter in two studies, both of which they funded, but only one which was embraced. Dockery et al. (1993) claimed PM2.5 was the toxic component in air. Styer et al. (1995) said they saw no association of PM10 with mortality. PM2.5 and PM10 contains PM2.5 and the two are highly correlated. Yet though the Styer data set is much larger than the Dockery data set, and even though the EPA did not have the Dockery data set (still doesn't) and the Harvard T.H. Chan School of Public Health refuses to provide it, the EPA still chose to go with Dockery. Why? The decision was (likely) made by the key “rain makers” for the EPA, Gina McCarthy, Mary Nichols and John Beale. Their careers were on the move and their environmental activism put them on the regulatory fast track. McCarthy now heads the EPA and Nichols heads the California Air Resources Board. Only John Beale suffered a setback. He was lead policy person for water and air at EPA for many years, brought in to navigate approval of the new Clean Air Act, but is now in jail for massive fraud at the organization, everything from time card faking to claiming he was a CIA operative, which is why he claimed he was missing work so often. How did this decision come to be? We know that more regulations mean less air pollution, but they claim more regulations have improved mortality. They further claim that new regulations have reduced heart attacks...due to lessened particulate matter. That's an emotional claim, not a science one, but it's how doublethink can overtake evidence. On the face of it, it's absurd that very low levels of small particles can cause heart attacks or stroke. Smoking even one cigarette gives a dose of particulate matter many orders of magnitude higher than particulate matter in current air levels. Since there are no autopsies which will show the cause of a heart attack, epidemiologists have to look at statistics. Credibly linking particulate matter to specific fatal mechanisms of heart attack or stroke is very difficult. Orientation. Y-axis is % increase or decrease of mortality. X-axis list air quality components, carbon monoxide, NO2, etc. A dot gives the mean change and the vertical lines give the 95% confidence limits. If the confidence limits do not overlap 0 then there is nominal statistical significance. Only 3/66, 4.5%, confidence limits fail to cross the no effect line, a result consistent with chance, which is 5%. 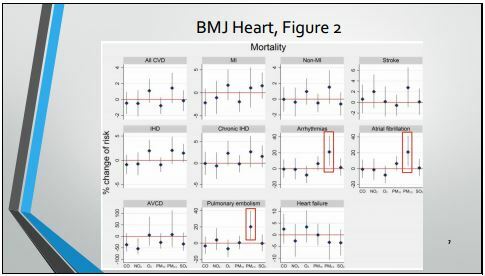 There are no effects for all cause mortality, MI or stroke the primary response variables. We appear to be looking at purely random effects. There are many other examples but I don't want to belabor the point, which is, why hasn't the EPA considered other studies? Why won’t they make data sets public? For example, for a study we secured a data set from California of over 2 million death certificates for the years 2000-2012. We then looked at the 8 most populous air basins. We obtained air quality, PM2.5 and ozone, and weather variables, min and max temperature as well as relative humidity. It's over 37,000 days of data, one of, if not the largest, air quality/acute mortality data sets extant and clearly the largest publicly available data sets. We have a new, large high-quality data set of acute deaths in California and the best statistical methods to examine the data, case control and time series regression. We used cross validation to evaluate the reliability of our data and methods, and could find no association. The empirical evidence is that current levels of air quality, ozone and PM2.5 are not causally related to acute deaths for California. Why wouldn't the EPA use that information, if the goal is to inform public health? They're trapped in doublethink, and it is self-serving and a trap of their own creation. Dr. S. Stanley Young is a Ph.D. in Statistics and Genetics and a member of the American Council on Science and Health Board of Scientific Advisors. He has authored or co-authored over 50 papers including six “best paper” awards, and a highly cited book, Resampling-Based Multiple Testing. He has two issued patents and is a Fellow of the American Statistical Association and the American Association for the Advancement of Science. He is an adjunct professor of statistics at North Carolina State University, the University of Waterloo and the University of British Columbia where he co-directs thesis work.He worked in the pharmaceutical industry on all phases of pre-clinical research, first at Eli Lilly and then at GlaxoSmithKline.